A venomous spider (Loxosceles reclusa) having a violin-shaped mark on the cephalothorax, native to the southern and central United States and found in dark undisturbed areas such as closets and sheds. Also called fiddleback spider. 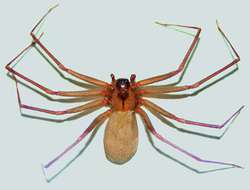 a small poisonous arachnid, Loxosceles reclusa, also known as the brown or violin spider, found in both North and South America. The bite produces a characteristic necrotic lesion. The venom from its bite usually creates a blister surrounded by concentric white and red circles. This so-called bull's-eye appearance is helpful in distinguishing it from other spider bites. There is little or no initial pain, but localized pain develops in about an hour. The patient may experience systemic symptoms; nausea, fever, and chills are common, but the reaction is usually self-limited. Immediate treatment includes keeping the victim quiet and immobilizing the bite area at the level of the heart. A bleb forms, sometimes in a target or bull's-eye pattern. The blood-filled bleb increases in size and eventually ruptures, leaving a black scar. Antivenin is not available in the United States. Bites of brown recluse spiders and suspected necrotic arachnidism. Patient 3, A 39-year-old woman was bitten by what we assumed was a brown recluse spider on the left upper eyelid while she was exploring a cave. Because brown recluse spiders are a relatively long-lived species (Hite et al. Previous studies at our institution have been performed to evaluate the effect of the brown recluse spider venom (BRSV) on human citrated plasma in vitro. History should exclude Lyme disease, rickettsia pox, and, in some parts of the country, brown recluse spider bites. History should exclude the possibilities of Lyme disease, rickettsia pox, and, in some regions, brown recluse spider bites. The brown recluse spider (Loxosceles reclusa) has been recognized as a cause of necrotizing bites since at least 1957, but most of the literature consists of laboratory studies using animals, human sera, or case reports of more dramatic examples of bite reactions. Brown recluse spider (Loxosceles recluse) venom phospholipase D (PLD) generates lysophosphatidic acid (LPA). In North America, once they were determined to be a public health threat, there was great interest in defining the distribution of the brown recluse spider, L.
Baker said if anything should be of concern, it's the violin spider or brown recluse spider, which her company sees more of in Santa Clarita.